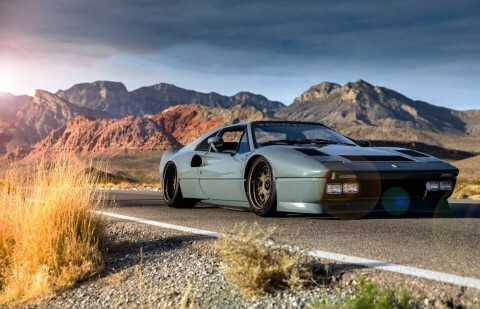 Rather more powerful than the 210bhp 208 turbo models that it replaced, and featuring all of the same styling changes as the new 3.2-litre 328 launched in 1986, this tax-break special is the final development of the transverse #V8-engined two-seat Ferrari series. One of 828 made between 1986 and 1989, it was first owned by a member of the Brunei royal family but clearly hardly used. The most recent keeper is selling, having decided that he doesn’t want to add to the tiny mileage. The car recently went to marque specialist Bob Houghton in Northleach for £3500 of remedial and recommissioning work, including new front dampers. It’s crisp and unscuffed, the Azzurro metallic paint deep and shiny, and the glassfibre roof panel protected in its bag. The blue leather seats are unworn, plus the dash top is perfect. Its tyres are Goodyear Eagles with full tread, but they’re not date-stamped so are probably the originals. The motor is clean, with a new oil pipe to the turbo, presumably fitted during the latest cambelt service in 2016, which also involved freeing off the clutch because the car had been standing for so long. The jack is still in its bag in the boot, and there’s a cover, along with the orange front marker light lenses that had to be changed for its MoT following import to the UK. We were prepared to be underwhelmed by how the car drives, but it’s actually really good, the 1991cc intercooled turbo version of the four-cam #V8 making it about as fast as a 328 but delivered in a more exciting way, the rush of torque at 4000rpm – with correct max boost of 0.6bar – feeling more immediate, after which it behaves similarly to the larger-engined car. The chassis is taut, the brakes work well and second gear is available more or less from the start. Warm oil pressure is 6bar at 3000rpm and above, temperature steady at 80ºC. The aircon blows cold, no surprise because the pump looks new, and both electric windows and mirrors work. The GTS Turbo will be sold with the factory warranty card and service book, plus the guarantee for the Tuff-Kote Dinol rust treatment done in 2015, and an MoT until January. It’s not yet British-registered, though the NOVA paperwork has been done, so it easily can be if it stays in the UK. Yes, if you fancy an interesting alternative to a 328: an immaculate one of those would cost about the same or perhaps a little more. The detail men epic reader resto! This incredible 328GTB became the subject of a very special restoration. Rosso Corsa resurrection. The purchase of this 328 blossomed into a budget-busting rebuild. When the owners of this Ferrari 328GTB bought it, they had no idea that an exacting rebuild lay ahead, says Ross Alkureishi. Photography James Mann. Best trip Any time that I’ve been up to the New Forest. Pike dreamt of owning a Giallo Fly 308, and he’s now enjoying the roads around the south coast in his very own example. I bought the Ferrari in 2001, and it caught my eye because it was Giallo Fly – the colour I’d always wanted since I first saw the 308GTB. I had the chance to buy a glassfibre car in the mid-1980s but sadly wasn’t able to afford it. That only increased my resolve, though. More than 15 years later, this 1977 right-hand-drive glassfibre example came up for sale. Once again, it was yellow with a black interior – my dream car. This time, I got straight on the phone and arranged a viewing. After a six-hour train journey to Sheffield, going over the car and test-driving it, I went home to have a deep think about it. My son Steve, being 10 years old at the time, didn’t understand why I’d need to July 2016 Classic & Sports Car 223 Send hi-res photos (300dpi) and 700 words to james.elliott@ haymarket.com or to the p4 address. For Guy Allen gen see: www.guyallen.co.uk think about buying a Ferrari! I then put down a deposit and the following week we were on our long way home with ear-to-ear smiles. My research has shown how rare these cars are getting. Only about 150 glassfibre 308s were made in right-hand drive. There were even fewer in yellow, and the dry-sump models were more scarce again. Over the years, I’ve gone through most of the bolts and swapped them with stainless-steel ones, while retaining the originals. The sills, meanwhile, have been replaced with new genuine parts because I wanted the few bits of metalwork on the car to be pristine. The underside of the front bumper also needed painting. As I removed it to carry out the work, I noticed that the front section where the spare wheel, battery and radiator sits had rotted out. Tony Johns Bodycraft fabricated a new section and welded it in. Luckily the rest of the chassis was solid. To gain access, we removed the wishbones, brakes, hubs and suspension to properly assess it. While doing so, we could see that the original bushes, wishbones and anti-roll bars were tired. We had them blasted and powdercoated, and fitted polyurethane bushes. I’d always wanted to lower the car slightly, and Steve talked me into getting some adjustable coilovers so that I could have it set up to exactly where I wanted it while still keeping the ride comfortable. Spax will soon be using it for its development car, but for now it features custom suspension by Protech. It’s a pleasure to drive and sits at a lovely height. While looking for 308 parts, I came across some F355 brakes so we bought them, along with braided brake lines, and had custom adapters and wheel spacers made. They make a huge difference over the originals. I’d already bought 16x8J versions of the factory wheels a few years ago so we knew they would fit over the brakes. The engine has been cleaned up with a few parts painted and an anodised dry sump, along with a stainless-steel quad-exit exhaust that was fitted when I bought the car. Future plans are to fit a deep front spoiler, a custom aluminium radiator and do an engine rebuild because the sodium-filled valves are known to deteriorate over time. I love driving it more than ever now and look forward to enjoying it over the summer. At some point, we hope to take it to the Maranello factory in Italy and see where it was made almost 40 years ago, then press on towards Monaco. Front end has had remedial work; tidying up the valance turned into a more involved job. Rotten front subframe needed replacing. New coilovers plus brakes from the F355. Original black interior has been retained. For as long as I remember all I ever wanted was a Ferrari – and not just any Ferrari. Being a child of the Eighties, it was a 308 GTS that was my bedroom wall poster car – and the craving to own one got stronger. Fast-forward to 2011. At the age of 30 I took stock and realised I was at last in a position to realise my dream. I talked to my wife, got the go-ahead and went hunting. I visited some classic car dealers but none of the cars or people were making the right impression. 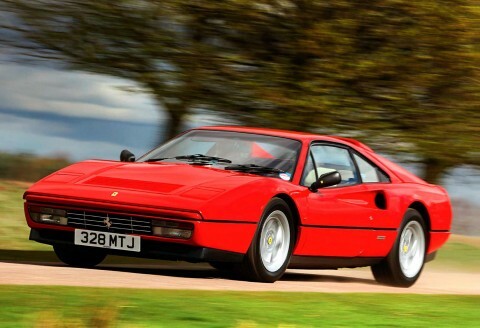 Then I noticed an ad online for a #1983 #Ferrari-308GTS-QV for £25k ono. I contacted the seller – it turned out he lived only a couple of miles away. On meeting Richard I knew straight away I’d found the right seller. He was Ferrari-mad and had just had a cambelt change done. After the test-drive came the negotiations. Within two hours of first seeing the car, I was shaking hands with Richards on the deal – £23,500. I was a Ferrari owner! I absolutely loved driving it. My wife had a Lotus Elise S1 at the time and I found it very similar in feel (albeit much older and heaver). I used it lots – not just for the odd day out but even commuting to work. One of my best experiences was taking the car to Ford’s test track at Dunton in Essex. I’d been invited as part of the Little Havens fundraiser: each year lots of supercars go along and members of the public can pay between £20-£50 to sit in as a passenger on a hot lap. I spent all day with petrolheads and car-mad kids going round the test oval – a day I won’t forget. So why did I sell it? Well, for the first few months I’d had it I’d hardly had to spend a penny on it. I knew it would need a service soon and the tyres were getting old, so I reckoned it would cost about £2500 to keep running it for another year – and I had plans for other cars I wanted to own. My rationale was that, if I kept the Ferrari, that would rule out owning any other fun cars. So I asked some dealers to give an idea of its value. A local specialist offered me £26,500 – so I sold it for a £3000 profit. After taking all my running costs into consideration, driving and owning a Ferrari for a year made me a £1k profit. I’ve never had a cheaper car to own than that. Even so, I’ll always regret selling it as it will always be my dream car. One day, I aim to have another. Mind you, a 308 has sold for more than £100k for the first time, so I may be priced out of the market. But I consider myself lucky I had the chance to own my dream car. So what’s next? I was interested to read Quentin Willson’s recent prediction that a Ferrari 456 could be a bargain and that £30k for a front-engined V12 Ferrari is better than money in the bank. I will have to dig out the article and leave it open somewhere for the wife to find.